The student housing at Grønneviksøren is an attempt to answer one of our biggest challenges in today’s growing cities: How to create good architecture for a great number of people who need homes for a low budget in the city center? Bergen is today home to 27 000 students spread over various academic institutions in the city. Planning accommodation complying with the future student’s needs will strengthen their role as active participants in the urban arena. As for today the city offers a wide range of social arenas for them to participate in. Their evaluation and renewal will be necessary to complete future residential strategies. The transformation area Gronneviksoren is located in the outskirt of the urban area with about 20 min. walking distance to the centre of Bergen. The project is a low cost building based on 727 modules manufactured in a factory and transported by boat to the construction site. Gronneviksoren represents one of the largest modular buildings in Europe. The student houses at Gronneviksoren consists of small living units and common functions distributed inside 17 different building groups with varying height up to 8 floors. The project is realized as two separate building blocks. This division into two independent blocks, ensures the overall ambition of clearly open visual and physical connections to the surrounding areas and the city center. Inside each block the building groups are connected with external galleries addressed towards the open inner courtyards. The external galleries has a width of 3 meters which provide that they can both be used as access walkways for the individual housing units, and common spacious outdoor areas for social encounters and activities. This provides the external galleries the clear role as semi-public zones of interaction between the individual housing units and the public areas. The open inner courtyards are developed as public outdoor spaces with different gardens and playgrounds that contribute to a wide range of activities. 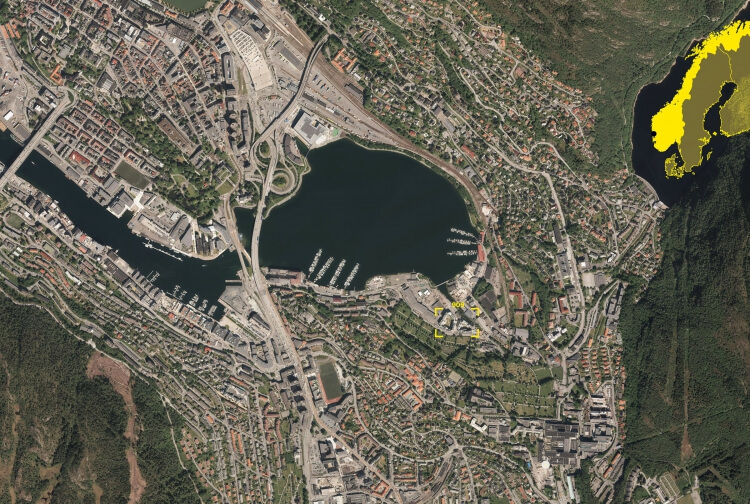 With a total capacity of around 1 000 students, the project is expected to have a positive impact on the overall rent levels in Bergen. Reducing the prices in the private marked and avoiding further uncontrolled increases, as it has done in the past year.